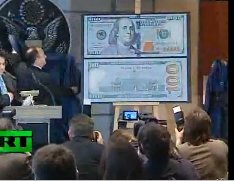 The United States government today unveiled the newly designed, and highly secure $100 dollar bill. Although the new $100 dollar bill was announced today, it is not expected to go into circulation until February of next year (2011). Federal Reserve Chairman Ben Bernanke told the AP that the new 100 dollar bill was part of an effort to deter counterfeiters, saying that the government estimates “that as many as two-thirds of all $100 notes circulate outside the United States” are fraudulent.